We love the chic lace and longer midi cut of this cute fitted dress. The ivory version would make a cute lace rehearsal dinner dress or bridal shower dress! The In The Middle Lace Midi Pencil Dress is fully lined at the bust and skirt, but is semi-sheer at the neckline, top back, bottom hemline, and at the panel at the waist. This dress has a rounded neckline, wide shoulder straps, and a classic fitted pencil cut. 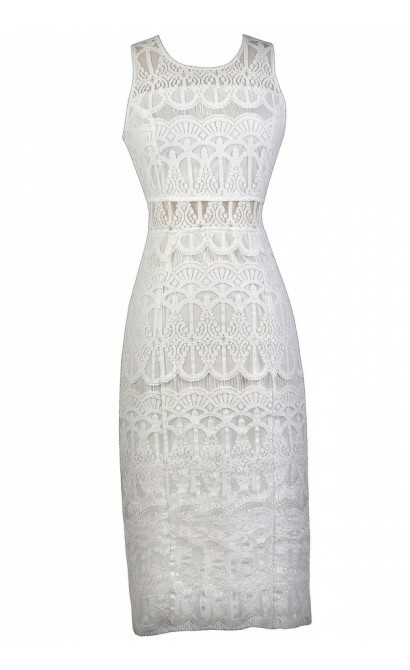 We love the gorgeous lace on this dress as well as the chic midi cut that keeps the look classy. A hidden back zipper completes this dress. The In The Middle Lace Midi Pencil Dress is perfect for any soiree. Pair it with pumps or strappy heels for a chic look. Another option is to wear a fabric sash or belt around the waist for contrast. Details: Lined at bust and skirt. Hidden back zipper. 80% cotton, 20% nylon. Lining: 100% polyester. Hand wash cold. Do not bleach. Hang or flat dry. Low iron. Small measurements: Length from top of shoulder to hemline: 44". Bust: 32". You have added In The Middle Lace Midi Pencil Dress in Ivory into Wishlist. 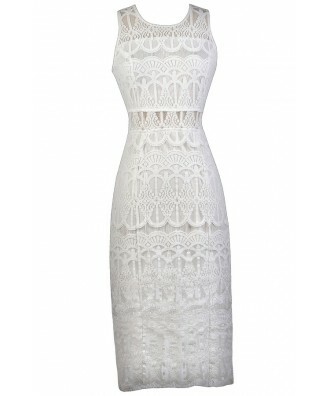 You have added In The Middle Lace Midi Pencil Dress in Ivory for Stock Notification. You have set In The Middle Lace Midi Pencil Dress in Ivory as a loved product. 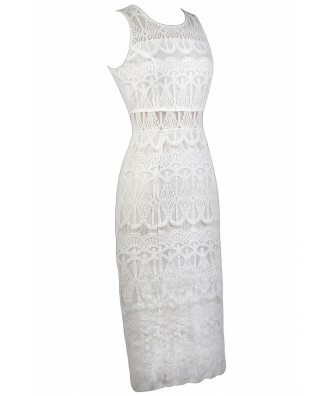 You have removed In The Middle Lace Midi Pencil Dress in Ivory as a loved product.